Join Fifi and her amazing group of friends in these 6 wonderful stories for the first time on DVD. Mystery In Flowertot Garden: Somebody has been going through the Tots' bins every night in Flowertot Garden. The tots turn detective to see if they can discover who the culprit is. Stingo's Bridge: Webby has told Pip the story of the 3 Billy Goats Gruff. Soon a troll takes up residence under the bridge in the garden and demands food paym..
Fifi Forget-Me-Not is full of energy and creativity, always smiling and looking for excitement! Fifi lives in Forget-Me-Not cottage and is always busy with her friends Bumble, Primrose and Violet out gardening or cooking or keeping a watchful eye on the naughty Stingo and Slugsy who are always looking for mischief and getting into trouble! But with so much to remember all of the time, Fifi often forgets things which leads to all kinds o..
Fifi Forget-Me-Not is full of energy and creativity, always smiling and looking for excitement! Fifi lives in Forget-Me-Not Cottage and is always busy with her friends Bumble, Primrose and Violet, out gardening or cooking or keeping a watchful eye on the naughty Stingo and Slugsy. These two are always looking for mischief and getting into trouble! But with so much to remember all of the time, Fifi often forgets things which leads to all..
Own Fifi And The Flowertots - Christmas Gift Pack DVD from Deff, DVD, Blu-Ray & 4K Video Specialists - Free UK Delivery..
Own Fifi And The Flowertots - Fifi 2 Hour Bumper Collection DVD from Deff, DVD, Blu-Ray & 4K Video Specialists - Free UK Delivery..
Own Fifi And The Flowertots - Fifis Carnival DVD from Deff, DVD, Blu-Ray & 4K Video Specialists - Free UK Delivery..
Own Fifi And The Flowertots - Fifis Chocolate Surprise DVD from Deff, DVD, Blu-Ray & 4K Video Specialists - Free UK Delivery..
Join Fifi and her amazing group of little Flowertot friends as they go about their lives in Flowertot Garden in 5 wonderful new stories for the first time ever on DVD. Fifi's Happy Day: Primrose is holding a party for Fifi. Everyone is helping get it ready, even Stingo and Slugsy who are in charge of making the cake. What could possibly go wrong?! Knitting Nonsense: Primrose is knitting something special, but when her knitting goes ..
Own Fifi And The Flowertots - Fifis In Charge DVD from Deff, DVD, Blu-Ray & 4K Video Specialists - Free UK Delivery..
Own Fifi And The Flowertots - Fifis Snowy Fun DVD from Deff, DVD, Blu-Ray & 4K Video Specialists - Free UK Delivery..
Join Fifi and her amazing group of little Flowertot friends as they go about their lives in Flowertot garden in 5 wonderful stories for the first time on DVD. Episodes: Fifi's Talent Show: All the tots enter a talent contest. Fifi is so busy helping all her friends prepare for their bit she does not have time to rehearse. Luckily her friends come to help. Everybody is amazed when the winner is announced... Smelly Slugsy: Slugsy has ..
Five more adventured for Fifi (voiced by Jane Horrocks) and her friends in the garden. Episodes are: 'Fun at the Fair'; 'Blueberry Surprise'; 'Daisy Chain Dance'; 'Slugsy's Rescue'; and 'Can We Have Our Ball Back?'.. 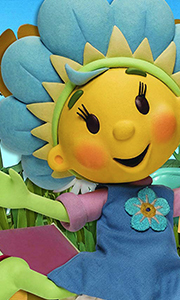 Own Fifi And The Flowertots - Gift Set Bumper Collection DVD from Deff, DVD, Blu-Ray & 4K Video Specialists - Free UK Delivery.. Happy Birthday Fifi. A collection of episodes to celebrate Fifi's Birthday. Inspector Stingo: Fifi's trowel has gone missing. Stingo decides to take the matter in hand and launch an investigation to find the culprit. Primrose Loses It: Primrose has broken her new necklace and lost the beads. She is incosolable. Violet holds a make and do party to replace the necklace. Pip's Pony: Pip wants a pony. He tries adapting his scooter and Vi..
Stingo's Enormous Carrot Pip is trying hard to grow some vegetables. But however hard he tries, they don't seem to get any bigger. But Stingo's vegetable patch next door appears to be doing suspiciously well. Dingaling Poppy Poppy has got a new trike to do her deliveries on. But she doesn't know how to ride it properly and keeps crashing into things. The tots take matters into hand and help Poppy learn to ride her trike safely. Slugsy..
Own Fifi And The Flowertots - Snowtime DVD from Deff, DVD, Blu-Ray & 4K Video Specialists - Free UK Delivery..
Own Fifi And The Flowertots - Snowy Collection DVD from Deff, DVD, Blu-Ray & 4K Video Specialists - Free UK Delivery..
Own Fifi And The Flowertots - Triple Pack Boxset DVD from Deff, DVD, Blu-Ray & 4K Video Specialists - Free UK Delivery..
Own Fifi And The Flowertots - Twinkle Time Bumper DVD from Deff, DVD, Blu-Ray & 4K Video Specialists - Free UK Delivery..